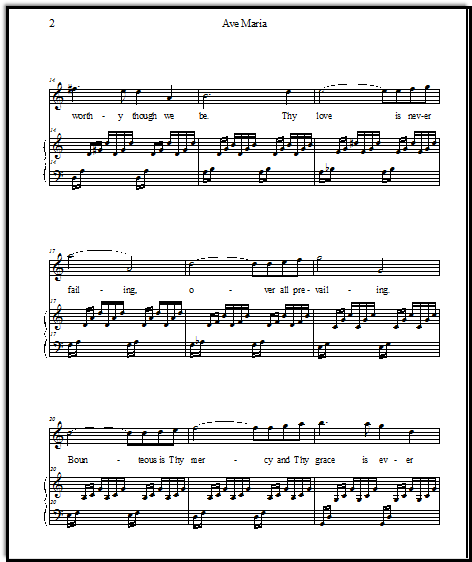 This free Ave Maria sheet music fulfills the desire for wedding ceremony music that is elegant and beautiful. There are many musical settings for the text "Ave Maria," but the one by Bach/Gounod is one of the most famous, and makes the loveliest of wedding songs. 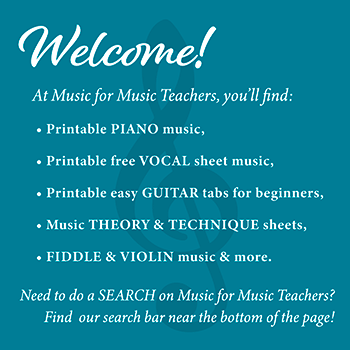 On this page, you'll free lead sheets in two languages, and downloadable piano accompaniments. 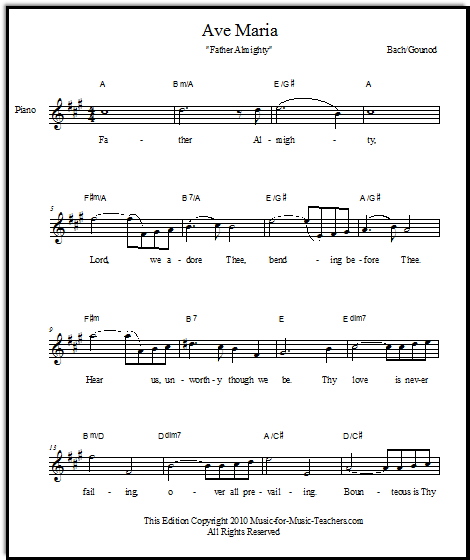 With alternative English words addressed to God the Father, this free wedding sheet music joins the ranks of Protestant Christian wedding songs. Yes, the Latin words are here too. The English words begin, "Father Almighty, Lord, we adore thee, bending before thee; hear us, unworthy though we be!" 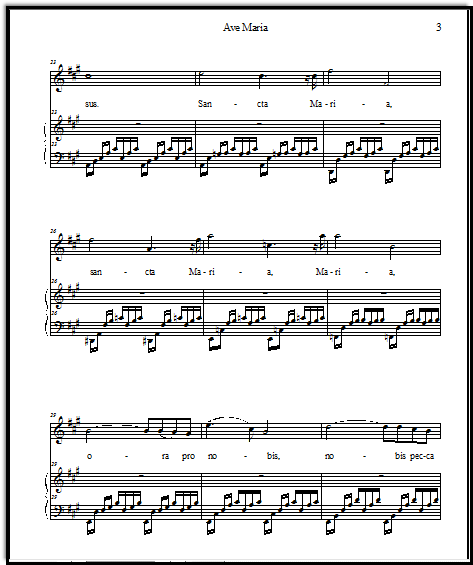 This first group of free Ave Maria sheet music lead sheets uses the Latin lyrics. 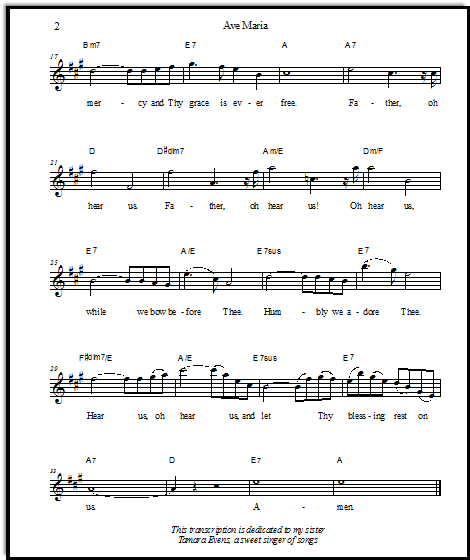 I have set it in multiple keys, (and in English as well) so that most instrumentalists can play it, as well as most vocalists sing it. 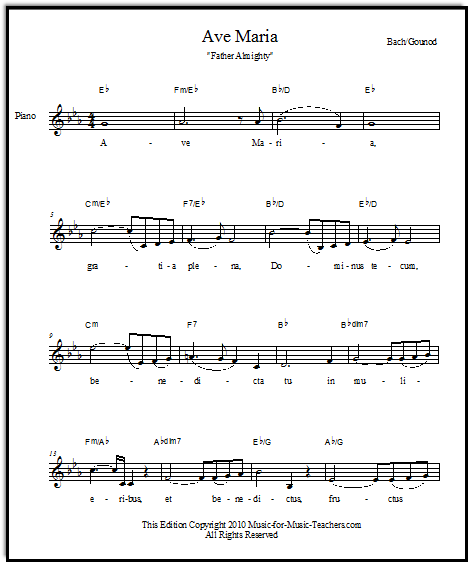 And now, here is the lead sheet for the English adaptation of Ave Maria, "Father Almighty." When I looked for wedding songs for my own wedding (many years ago! ), none of the Christian wedding songs seemed as beautiful to me as this English prayer. For non-Catholic Christians, and particularly for wedding ceremony music, the English words substituted here, "Father Almighty... Lord, we adore Thee...etc." are much more meaningful. The prayer ends with the words "Hear us, oh hear us, and let Thy blessing rest on us." 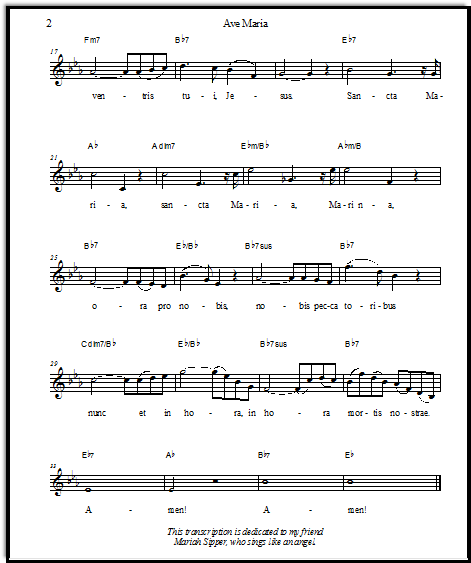 This is how it was sung at my wedding, but I do not know who wrote the English words, as I can't find them anymore! 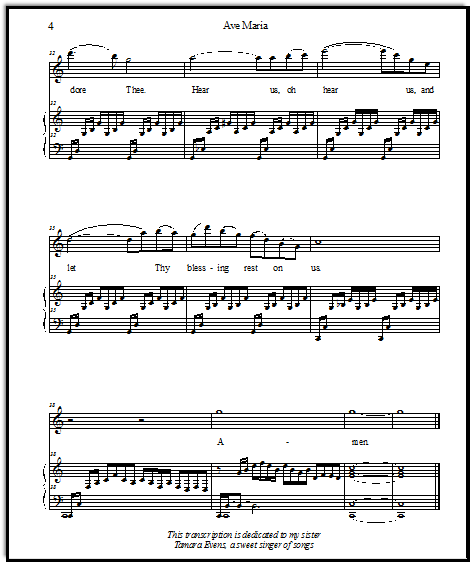 Here is the Latin Ave Maria with piano accompaniment. It sounds like the Bach Prelude in C, because it is! Charles Gounod took Bach's lovely prelude and composed a melody to layer over the top of it. Unlike most of my public domain arrangements and music, it is not free, but is for sale. I am charging $5.00 for UNLIMITED COPIES, in all 6 keys!! 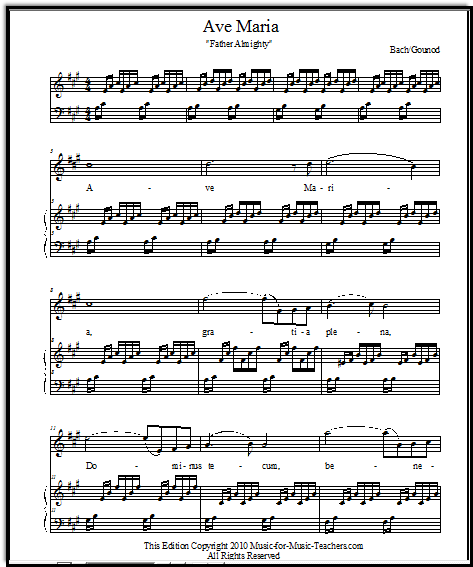 Buy Ave Maria Latin vocal & piano accompaniment in all 6 keys, with the right to make unlimited copies, $5.00! Buy this beautiful song in English in all 5 keys for $5.00 - with the right to make UNLIMITED COPIES! So why should you buy Ave Maria (Latin) or Father Almighty (English adaptation) arrangements from me, aside from the fact that it is hard to find, and there are no other English adaptations available (that I know of)? I give you permission to make UNLIMITED COPIES, for YOUR STUDENTS ONLY, of these two arrangements. This song is available immediately as a digital download onto your computer. In 5 keys, for English ("Father Almighty") and 6 keys for Latin, "Ave Maria"! I give you permission to make UNLIMITED COPIES legally (for your students only). When you need music, you usually need it NOW. Your accompanist, your soloist-student... let them have this music without fear of copyright infringement. And help them learn respect for the musician's trade! What is interesting about the history of this wedding ceremony music is that J.S.Bach, who wrote the Prelude in C (which forms the underlying harmonic foundation for this song) was a German Protestant. Charles Gounod, who composed the lovely soaring melody and set it over Bach's C Prelude, was a French Catholic who for a time considered entering the priesthood. Like many Catholic composers, he wished to make a setting of the Ave Maria (a prayer to Mary). It is a beautiful setting.